Pinterest is no longer considered to be a big player compared to the dominating social media platforms such as Facebook and Instagram. Yet, that doesn’t mean that Pinterest isn’t a powerful marketing tool that can help you market your blog, increase traffic and get conversions with. In fact, Pinterest Drives More Traffic to Publishers Than Twitter, LinkedIn, Reddit Combined. 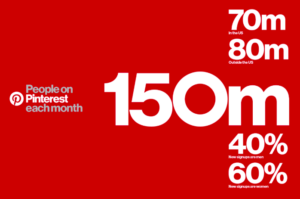 Pinterest still currently boasts 150 million active monthly users, and that’s more than you can chew if you would reach them all. Pinterest marketing can help bring a lot of visitors to your site. And ultimately help your search engine ranking and blog-awareness. While the majority of Pinterest’s users are female, Pinterest is growing in popularity among men. So, there’s no question why the majority of users in the U.S. are still female, and the top categories of content on Pinterest is home, arts & crafts, style & fashion, inspiration & education, food, travel, kids and products. The good news is that if your blog or website works inside of these industries, you know that your target audience to be found. The less good news is that if you aren’t inside these industries, you might have a tougher time finding your target audience. However, that does not in any way mean that you won’t be able to. It might just demand a bit more research and effort. In this article, we”ll give you the best and most effective ways on How to Market Your Blog on Pinterest. The best way is to treat your pinterest page like a startup, in that way, you’re not only focusing on how you can shove as many ads down your audience’s throats as possible, instead you’re focusing more on who you will target, their interests, their pain points and how you can provide your solutions to them. Once you’ve done that, you can start implementing the tactics that will help you market your blog on Pinterest, and do it in a more efficient way now that you know your audience. Because Pinterest is a visually driven platform, it’s important that you have unique, interesting and appealing content on your page. This might help make you the thought-leader in your industry. Ultimately, this leads to more followers, more profile visitors more repins and ultimately more website traffic and possible conversions in the future. 4. Repin from people’s boards. Share content from your blog and include the link to your website on the image. This is probably the most common way that Pinterest users market their blog and that’s simply because it’s so effective. They simply share an appealing piece of content from their website, and them when someone taps the pin, they’ll get automatically redirected to your blog. Also known as Jab jab jab, right hook, which is a book written by entrepreneur and marketing expert Gary Vaynerchuk who speaks about the importance of giving before you ask for something. Nowadays, he feels like brands are all about taking, taking, taking and sometimes without even asking. If you want to create long-lasting connections with your audience, you need to first give, and in this case, it’s about repinning your audience’s content. After you’ve done that three times, you might be able to ask for one return favor, for example, “check out my website”. The point is to always provide value and focus on giving back because that’s when you’ll see results long-term. Not all of your focus should be put towards your own boards. A general rule is that you should spend roughly 3/4 of the time you spend on Pinterest on other boards and pins. By contributing, you’re providing value while at the same time marketing your blog. The idea behind this is to send signals that you’re not only asking, asking, asking but also giving, value to your audience. Curate interesting and original content that your audience finds appealing to get your followers to continue following you and also repin your pins. You of course want to receive as many repins as possible because this is free marketing to your blog which your audience does for you. Sounds like a great deal to me! People who are successful in using Pinterest can be seen pinning frequently and doing it strategically. This helps get their account discovered by the people who got their content repinned. (That’s the jab). After that, you want to promote your website with the help of visual content that no one can resist, also that is relevant to the people you are targeting. That’s why it’s important that you only engage with people in your industry and niche. If there’s something you need to know about How to Market Your Blog on Pinterest, it is that consstency is key. If you all of a sudden stop doing it, you won’t get any results from it. If you are selling something from your blog/website, rich pins is a great way to market your products through Pinterest. Rich pins allows you to use your account for e-commerce and online sales. With Rich Pins, you can add prices and availability directly in the app, further empowering your “right hook” message about people visiting your website. No matter what you’re doing, measuring results is key for improvements. pinterest business accounts get access to tons of helpful Analytics of how your page performs, so you can learn what type of content is most popular, what resonates well with your followers and what doesn’t. With the analytics tool, you can also see at what times you’re generating the most traffic, which is super helpful for this exact purpose.